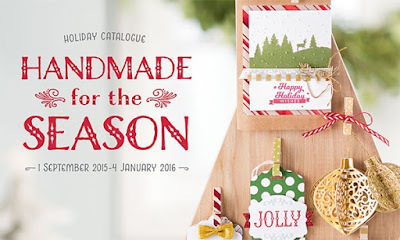 Stamp with Me: Handmade for the Season! September is finally here, and now can enjoy the new holiday catalogue with the rest of us! If you’re like me, I just couldn’t wait to get my hands on new products and see all of the creative possibilities. You will fall in love with at least one of the project kits, and there’s fantastic opportunities to save with the ‘Bundle & Save’ offers on coordinating products. Maybe one of the accessories will catch your eye and you simply won’t be able to resist. Did we say maybe? We meant definitely. You definitely won’t be able to resist.